A halogen lamp, also known as a tungsten halogen, quartz-halogen or quartz iodine lamp, is an incandescent lamp that has a small amount of a halogen such as iodine or bromine added. The combination of the halogen gas and the tungsten filament produces a halogen cycle chemical reaction which redeposits evaporated tungsten back onto the filament, increasing its life and maintaining the clarity of the envelope. Because of this, a halogen lamp can be operated at a higher temperature than a standard gas-filled lamp of similar power and operating life, producing light of a higher luminous efficacy and color temperature. The small size of halogen lamps permits their use in compact optical systems for projectors and illumination. A carbon filament lamp using chlorine to prevent darkening of the envelope was patented in 1882, and chlorine-filled "NoVak" lamps were marketed in 1892. The use of iodine was proposed in a 1933 patent, which also described the cyclic redeposition of tungsten back onto the filament. In 1959, General Electric patented a practical lamp using iodine. 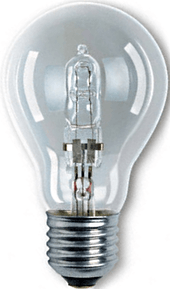 In ordinary incandescent lamps, evaporated tungsten mostly deposits onto the inner surface of the bulb, causing the bulb to blacken and the filament to grow increasingly weak until it eventually breaks. The presence of the halogen, however, sets up a reversible chemical reaction cycle with this evaporated tungsten. The halogen cycle keeps the bulb clean and causes the light output to remain almost constant throughout the bulb's life. At moderate temperatures the halogen reacts with the evaporating tungsten, the halide formed being moved around in the inert gas filling. At some point, however, it will reach higher temperature regions within the bulb where it then dissociates, releasing tungsten back onto the filament and freeing the halogen to repeat the process. The overall bulb envelope temperature must be significantly higher than in conventional incandescent lamps for this reaction to succeed, however: it is only at temperatures of above 250 °C (482 °F) on the inside of the glass envelope that the halogen vapor can combine with the tungsten and return it to the filament rather than the tungsten becoming deposited on the glass. A 300 watt tubular halogen bulb operated at full power quickly reaches a temperature of about 540 °C (1,004 °F), while a 500 watt regular incandescent bulb operates at only 180 °C (356 °F) and a 75 watt regular incandescent at only 130 °C (266 °F). The bulb must be made of fused silica (quartz) or a high-melting-point glass (such as aluminosilicate glass). Since quartz is very strong, the gas pressure can be higher, which reduces the rate of evaporation of the filament, permitting it to run a higher temperature (and so luminous efficacy) for the same average life. The tungsten released in hotter regions does not generally redeposit where it came from, so the hotter parts of the filament eventually thin out and fail. 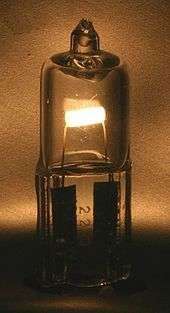 Quartz iodine lamps, using elemental iodine, were the first commercial halogen lamps launched by GE in 1959. Quite soon, bromine was found to have advantages, but was not used in elemental form. Certain hydrocarbon bromine compounds gave good results. Regeneration of the filament is also possible with fluorine, but its chemical reactivity is so great that other parts of the lamp are attacked. 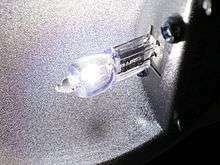 The halogen is normally mixed with a noble gas, often krypton or xenon. The first lamps used only tungsten for filament supports, but some designs use molybdenum – an example being the molybdenum shield in the H4 twin filament headlight for the European Asymmetric Passing Beam. For a fixed power and life, the luminous efficacy of all incandescent lamps is greatest at a particular design voltage. Halogen lamps made for 12 to 24 volt operation have good light outputs, and the very compact filaments are particularly beneficial for optical control (see picture). 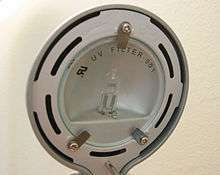 The ranges of multifaceted reflector "MR" lamps of 20–50 watts were originally conceived for the projection of 8 mm film, but are now widely used for display lighting and in the home. More recently, wider beam versions have become available designed for direct use on supply voltages of 120 or 230 V.
A technical diagram depicting the power of a halogen light at various wavelengths. 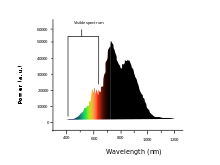 An overlay of the visible light spectrum can be seen along the left side. Like all incandescent light bulbs, a halogen lamp produces a continuous spectrum of light, from near ultraviolet to deep into the infrared. Since the lamp filament can operate at a higher temperature than a non-halogen lamp, the spectrum is shifted toward blue, producing light with a higher effective color temperature and higher power efficiency. This makes halogen lamps the only option for consumer light source with Black-body radiation spectrum similar to that of the sun and most suitable for the eyes. Alternatively, multi-component glasses can be used, which have a natural UV-block. These glasses belong to the family of the aluminosilicate-glasses. Any surface contamination, notably the oil from human fingertips, can damage the quartz envelope when it is heated. Contaminants will create a hot spot on the bulb surface when the lamp is turned on. This extreme, localized heat causes the quartz to change from its vitreous form into a weaker, crystalline form that leaks gas. This weakening may also cause the bulb to form a bubble, weakening it and leading to its explosion. Halogen lamps were used on the Times Square Ball from 1999 to 2006. However, from 2007 onwards, the halogen lamps were replaced with LED lights, both to reduce electrical costs, and due to the much longer potential lifespan (about ten times longer for LED over incandescent). The year numerals that light up when the ball reaches the bottom used halogen lighting for the last time for the 2009 ball drop. It was announced on the Times Square website that the year numerals for the 2010 ball drop would use LED lights. Tungsten-halogen lamps have been commonly used as the light sources in automobile headlamps, but are increasing being replaced by Xenon and LED lights. R7S: linear halogen lamp measuring 118mm or 78mm. Also known as a double ended halogen lamp. There are also less common 189mm, 254mm and 331mm R7S lamps. Halogen lamps are the heating-elements in halogen ovens. Halogen multifaceted reflector bulbs are widely available. The most common format is MR16, which is available in 10–50 W power ratings (150–800 lumens). Low voltage lamps use the MR16 and similar bi-pin bases, whereas mains voltage lamps use the same caps as normal mains tungsten filament lamps, or a special GU10/GZ10 base. The GU10/GZ10 bases are shaped to prevent dichroic reflector lamps being used in luminaires intended for aluminised reflector lamps, which could cause overheating of the fitting. Higher efficiency LED versions of all of these lamps are now available, but these have widely varying light output and quality. Tungsten halogen lamps are used in the majority of theatrical and studio (film and television) fixtures, including Ellipsoidal reflector spotlights, Source Four, and Fresnels. PAR Cans are also predominately tungsten halogen. ↑ Robert Wolke (29 July 2009). What Einstein Told His Barber: More Scientific Answers to Everyday Questions. Random House. p. 52. ISBN 978-0-307-56847-2. ↑ Fire and Life-Safety Group. "Torchiere Halogen Lamps and Plastic Shades - Policies and Procedures". University of Colorado Boulder. ↑ Häussinger, Peter; Glatthaar, Reinhard; Rhode, Wilhelm; Kick, Helmut; Benkmann, Christian; Weber, Josef; Wunschel, Hans-Jörg; Stenke, Viktor; Leicht, Edith; Stenger, Hermann (2002). "Noble gases". Ullmann's Encyclopedia of Industrial Chemistry. Wiley. doi:10.1002/14356007.a17_485. ↑ Kremer, Jonathan Z. "Types of Light Bulbs and Their Uses" Megavolt, section "Halogen", Accessed May 26, 2011. ↑ "Times Square Alliance – New Year's Eve – 2010 Widgets". ↑ "Replace Inefficient MR16 Halogen Lamps with LEDs". Maxim. September 25, 2007. Wikimedia Commons has media related to Halogen light bulbs.